Triscuit crackers are Non-GMO Project verified. How do you make Wheatberry Clusters? Where can I find Wheatberry Clusters in store? When would I eat Wheatberry Clusters? How do Wheatberry Clusters taste? A wheat berry is a whole, unprocessed kernel of wheat that contains all three parts of the grain, including the bran, germ, and endosperm. It is whole grain wheat in its original form. Wheat berries are commonly ground up into flour, but they make for a tasty ingredient in our Clusters. Our crunchy wheat berries are roasted and clustered together with real ingredients like dried fruit, seeds, and nuts. Each cluster is bite-sized for a satisfyingly delicious portable snack. You can find Triscuit Wheatberry Clusters in the cracker aisle, as well as at your favorite online retailer. You can eat Triscuit Wheatberry clusters, made with plant-based fuel, as a snack in the afternoon. 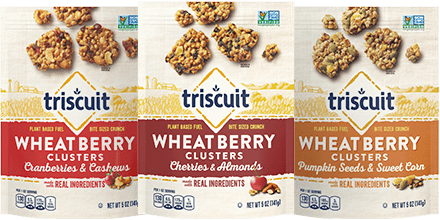 Conveniently packaged in a resealable pouch, you can take Triscuit Wheatberry Clusters along with you anywhere you go--at work, on your way home or to the gym. Be sure to share them! We think Wheatberry Clusters are delicious. The roasted wheat berries bring forth a nutty flavor that is complimented by real ingredients like dried fruit, nuts and seeds. Try all three varieties to taste the flavor for yourself! For over 100 years, Triscuit Original crackers have started with 100% whole grain wheat, oil and salt. As reflected in our recipes, we’re committed to understanding and meeting the needs and preferences of our consumers. That’s why the entire portfolio of Triscuit crackers is Non-GMO Project Verified, and the “Non-GMO Project Verified” butterfly logo is clearly labeled on all packaging. At Triscuit we’re passionate about crafting delicious crackers that align with consumer preferences. DO TRISCUIT PRODUCTS CONTAIN INGREDIENTS DERIVED FROM GMOS? WHAT STEPS HAVE BEEN TAKEN TO VERIFY THAT TRISCUIT INGREDIENTS MEET SUCH STANDARDS? WHY IS TRISCUIT MAKING THE SWITCH TO NON-GMOS? A GMO is a genetically modified organism. GMOs are plants or microorganisms that have had their genetic material artificially generated or engineered through the use of modern biotechnology. Common uses for such genetic engineering are enhancing the nutrition of foods derived from a plant, giving a plant herbicide/virus resistance, and improving a plant’s protections against insects. According to a report by the National Academy of Sciences, a group established by the U.S. Congress to provide expert scientifically-based advice, currently marketed foods derived from GMOs have proven to be safe to eat. The wheat in Triscuit crackers has always been produced without modern biotechnology, and no genetically engineered wheat is currently available for commercial use. As part of our promise to always work to meet customer preferences, we’ve made a commitment to use only oil and seasonings that meet “The Standard for the Non-GMO Project Verification program” in all Triscuit varieties. We understand that it’s important to our customers to know where their food is coming from and how it’s made. That’s why we’ve brought in the Non-GMO Project, a non-profit organization that provides third-party verification for products made according to best practices for GMO avoidance. We’re working together to make sure that our products meet the standards to be Non-GMO Project Verified. We think they taste delicious. You should try them! We know that our customers want ingredient transparency for their snacks. Having Triscuit products verified by the Non-GMO Project is one way we can ensure that. 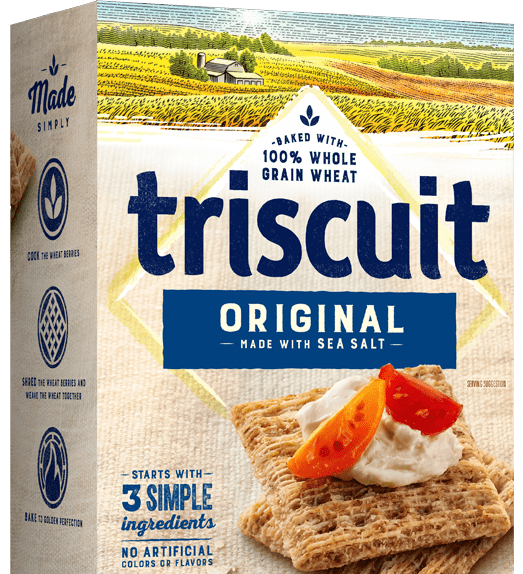 As part of our ongoing commitment to transparency and serving our customers, all Triscuit products in our portfolio are “Non-GMO Project Verified. Triscuit crackers start with three simple ingredients. The original Triscuit ingredients are simple — just wheat, oil & salt. Make ‘Scuit Happen with Triscuit recipes like tomato, feta and dill. Layer hummus, cucumber and chili flakes to make delicious Triscuit appetizers. you’re only limited by your appetite. See how you can make your own Triscuit recipe with any three ingredients.